Many times we have been in the Farmington area and wanted to visit this site, but somehow we got side tracked. This time we made the plans to visit, not just this site, but also Salmon Ruins (I'll write about this another day), and didn't tell anyone until we were done. We were determined not to miss out on either! Better begin at the beginning of this adventure; when we go to Farmington, we usually take the La Plata Highway (Route 140 in Colorado, Route 170 in New Mexico) for it is a more scenic route. Before reaching La Plata, there is a road sign indicating the way to Aztec along Route 574, and we decided to take this route instead of backtracking through Farmington. Route 574 is not the most scenic of routes; it is sort of like driving through an oil field, as there are pump jacks, storage tanks, and oil rigs all along the road. The ride to Aztec is only 14 miles to reach the junction of Route 516; make a left onto Route 516 and at the light, make a left turn onto Ruins Road. Keep driving until the end of the road, you cannot miss the entrance. At first, the main building looks small, but don't be fooled...it gets bigger! Before going in, take a moment to read the dedication plaque by the stairway; and the information boards on the building itself. Once you get inside, the gift shop is to the left and ahead is the check-in counter; the folks manning the desk are the friendliest; pay your fee and you'll receive a guide book to help you with the ruins. This guide book you need to return to the desk when you're done, but you can purchase a smaller version of the book for just a couple of dollars. To the right is either the exit to the ruins, or the museum...do NOT miss the museum; there are fascinating artifacts and information boards to help you understand the Puebloan people. Now to the ruins themselves and prepare to be awed! As you exit onto the back patio area, the ruins are immediately in your sight. Follow the guide book, stay on the designated pathway and the posted at the ruins correspond to numbers in the book. This is a wonderful place to visit, so do NOT rush through it. The first building you enter is The House of the Great Kiva; this is a reconstruction over the Great Kiva which was founded in 1921. As soon as you enter, you will notice the quiet and serenity; you know immediately that you are standing within a sacred place...keep quiet and behave yourself! 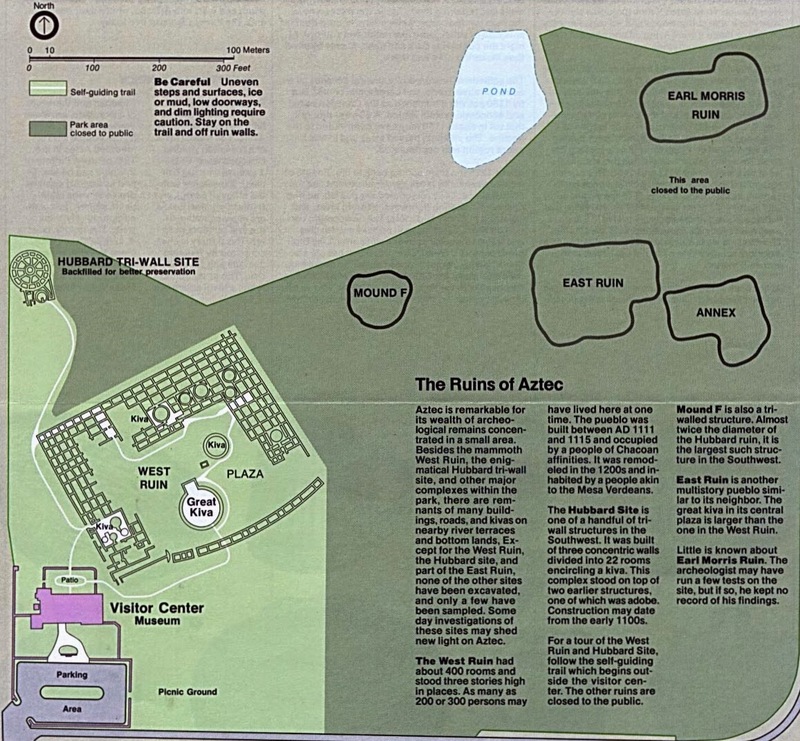 I highly recommend you purchase a book from the gift shop entitled, "The House of the Great Kiva at the Aztec Ruin" by Earl H. Morris; it's only four dollars and full of information. Exiting the House of the Great Kiva, there will be another Kiva nearby; to the right will be the eastern side of the West Ruins. There is one section where you can go through various doorways and inspect the rooms beyond. Be warned, depending on your height, you may be crawling through; I personally banged an elbow once, knee once and my head seven times! There are other ruin sites in the area, but they are closed to the public. Here's a map to give you a better perspective. Maintenance is a Constant Job at the Ruins. River Stones used for Patching a Wall. Roy is 5'10" tall; notice how he barely fits through the doorway. There are also sections of the central part of the West Ruins you can walk through; the guide book will help explain the differences in structures and point out the "T-shaped doorway"; wooden logs still within the walls; the alignment of doors and windows throughout. At one point you will be able to follow a path to deeper rooms and walk through them to the far western wall. Remember to duck! Kiva located in the central part of the West Ruins. Doorways through the back rooms. Once you exit the back rooms, check out the wall to your left as you begin walking back towards the museum. Notice the rows of green sandstone? The archaeologists are not certain why they're there, but think it might have to do with water and protection for the community. View of West Ruins from Kiva. In our travels throughout the Four Corners, Aztec Ruins National Monument is in our top ten of state and national parks and/or monuments. The settlement itself is fascinating; the guide book you use for the self-guided tour is detailed, so you know what you're exactly looking at. Most definitely add this to your own list of "must visit" places! 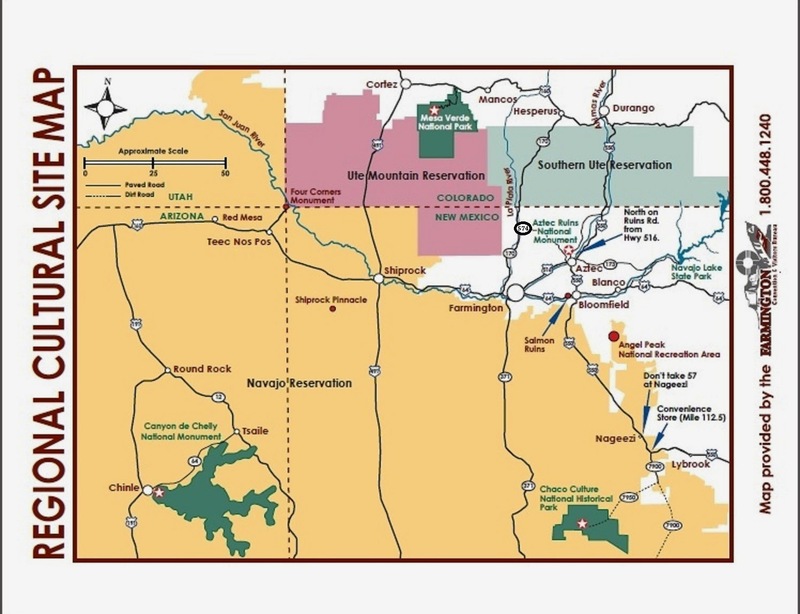 Now I'm going to give a little more incentive by posting a map of the Four Corners area, so you can see for yourself how easy it is to reach Aztec after visiting other sites, such as Chaco Canyon or Mesa Verde. You've got no excuses now! Roy and I would like to thank the staff at Aztec Ruins National Monument for the great visit we had; answering our numerous questions and being so very friendly.